Click here for all other pictures and pages by Brian. A car, a pair of skis, and 86 days of freedom. Click here to see "on location" blurbs as they happened each day. Click here for a summary of my itinerary. Whistler gallery, Clarkston gallery, Sun Valley gallery, Albuquerque gallery, Eli's Motorcycle Trip, Taos gallery, Paige Taos Accident, Santa Fe gallery, Purgatory gallery, Telluride gallery1, Steamboat gallery, Boulder Area gallery, Winter Park/Mary Jane gallery, Breckenridge gallery, Copper Mountain gallery, Keystone gallery, Arapahoe Basin gallery, Telluride Tune and Tour gallery, Telluride gallery2, Ostentatious Log Cabins of the Filthy Stinking Rich in Telluride, Hike Up Telluride's Gold Hill, Dinner with Johnny Rotten, 221 Oak Street, Telluride gallery 3, Vail gallery, Snowmass gallery, Aspen Highlands gallery, My Spooky Trip Through Area 51 (with Space Aliens and Mutilated Cows), Mammoth gallery, Debbi and Mike in Thousand Oaks gallery, Jim and Judy Young in Santa Barbara gallery, Mom and Dad's House gallery, Willamette Pass gallery, Hoodoo gallery, Bachelor gallery, Bachelor gallery 2, Random Oregon gallery, Northstar gallery, Squaw gallery. Why Stairs To Every Bathroom?, Helmets Laws for Skiers, Only One Way to See America, Senior Citizen Skiers. 11/27/98 Alpine Meadows First day of the season! 1/23/99 Snowbird First day in Utah. 1/24/99 Alta 12" fresh powder that fell overnight! 1/25/99 The Canyons HUGE resort, got fresh tracks in 18 inches of powder in sunshine. Awesome day. 1/30/99 Whistler First day on the snow in Canada, fresh snow, a little sunshine. 2/1/99 Blackcomb (Day 10) More and more snow, top closed due to high winds. 2/2/99 Whistler Packed up, checked out of condo, then skied Whistler once more. 2/6/99 Sun Valley First day at Sun Valley, icy rain chased me off the slopes early. 2/7/99 Sun Valley 18 inches of powder, sweet day. 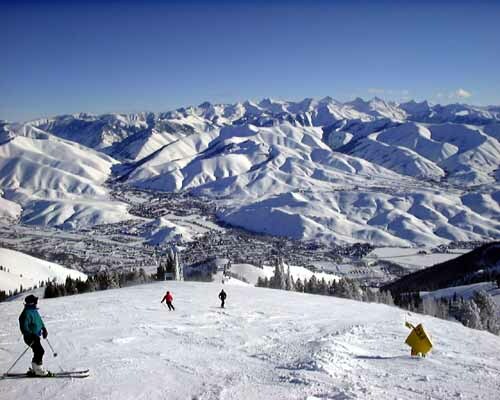 2/10/99 Sun Valley Skied in sunshine, then headed south to Albuquerque. 2/13/99 Taos Skied in sunshine, Paige whacks her skull. 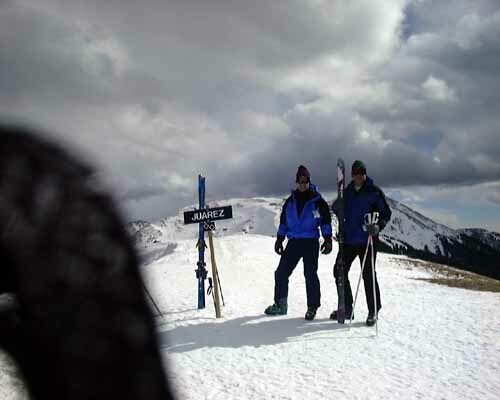 2/15/99 Taos Hiked up to the ridge to ski Juarez double black. 2/18/99 Santa Fe Ramey and I skied in the sunshine. 2/20/99 Purgatory Skied Purgatory, Colorado. 2/21/99 Telluride (Day 20) First day in Telluride! Kind of hard pack. 2/23/99 Steamboat Skied on a day old 8 inch drop, very nice. 2/27/99 Breckenridge A little windy, but nice. 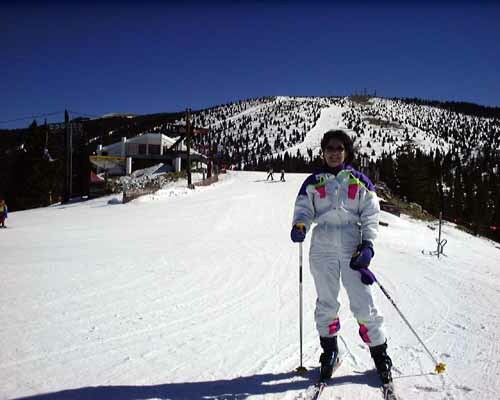 2/28/99 Copper AND Keystone Skied Copper Mountain during the day, then night skiing at Keystone! 3/1/99 Arapahoe Basin Skied morning at Arapahoe, then drove to Telluride. 3/3/99 Telluride Got the tune and tour from Lance. Great day in the sunshine. 3/8/99 Telluride Fresh powder for my return to Telluride! 3/9/99 Telluride Man, that powder went fast! Icy and cruddy today. 3/10/99 Telluride (Day 30) Skied with Ken and Lise. 3/13/99 Telluride More fresh powder, hiked up Gold Hill. 3/14/99 Telluride Skied in the sunshine! 3/15/99 Telluride Skied wth Lise and Lance, snow's getting hard-pack, spring conditions. 3/17/99 Telluride Skied with Lise. Spring slush, warm weather. 3/18/99 Telluride Skied. Kind of overcast. 3/19/99 Telluride Skied. Balmy weather, good spring snow conditions. 3/21/99 Telluride Serious slush, TONS of sunshine, a few rocks. 3/22/99 Telluride Big sunshine, little snow. My last day at Telluride unless it snows! 3/24/99 Vail (Day 40) Big sunshine, big slopes, big slushy conditions. Some pictures. 3/25/99 Vail More big sunshine. 3/26/99 Snowmass AND Aspen Highlands Snowmass in the morning (pictures), Aspen Highlands in the afternoon (pictures). 3/29/99 Mammoth Mammoth in the sunshine (pictures). 4/3/99 Mammoth (Day 45) Skied Mammoth GREAT POWDER, then drove to Debbi and Mike's in L.A.
4/10/99 Willamette Pass Skied 18 inches of fresh Oregon powder. Click here for pictures. 4/11/99 Hoodoo Skied in the sunshine. Click here for pictures. 4/13/99 Bachelor Skied in the sun. Click here for pictures. 4/16/99 Bachelor (*** DAY 50 ***) That's "fifty days", baby! Skied in the sunshine. 4/17/99 Bachelor Last ski day of the sabbatical. Spring Oregon conditions. 4/24/99 Northstar Spring Tahoe Trip! Click here for pictures. 4/25/99 Sqaw Spring Tahoe Trip! Click here for more pictures. "powder" : fresh, light, fluffy snow. The very best snow to ski on. "face shots" : skiing through powder so deep it sprays up and hits the skier in the face. Very fun. "mashed potatoes" : wet, old, heavy snow that is hard to turn skis in. "death cookies" : patches of broken up ice and hard snow chunks that are difficult to ski on, usually made by grooming machines moving too fast. "Sierra Cement" : mashed potatoes snow in the Sierra mountains (Lake Tahoe, California). "Cascade Concrete": Similar to Sierra Cement but refers to the snow in the NW Cascade mountains. "bumps" or "moguls" : mounds of snow usually about 1 - 2 feet tall that skiers enjoy skiing over. "cordouroy" : groomed snow, where a grooming machine has left very fine parallel lines in the snow. "ego bumps" : well spaced, small moguls on an intermediate slope that are easy to ski. "cancer" : the rocks and dirt that poke through the snow on a run with light snow coverage. "local" : a person who lives in a ski town. Locals are usually great skiers with a bit of disdain for tourists. "gaper" (pronounced gay-per) : a person who owns all the right equipment, looks great standing in the lodge, but is a terrible skier. Used by locals to make fun of tourists. "texan" or "howie" : a bad skier, see "gaper" above. I'm not sure of the origins of these terms. "trust funders" : young skiers from rich families whose skiing lifestyle is afforded from their wealth or trust fund. They do not have to work. "trust-a-farian" : a trust funder with dreadlocks. Surprisingly common. You see them get out of their Range Rovers at the ski slopes sometimes. "shredding" : originally pertaining only to snowboarders, good hard fast skiing, making good turns. "Owning" the mountain. "yard sale" : when a skier falls and his hat, skis, gloves, and poles are left strewn about the slope. "ski bunny" : a beautiful woman on a ski hill. Doesn't have to be that good at skiing. "yo-yo" : a skier who buys a lift pass, rides the ski lift up to the top, then ducks under the boundary rope and skis out of bounds to ski fresh untracked powder. This is illegal in most places. "helicopter" : when a skier jumps off a bump and spins around 360 degrees and lands facing forward. An extremely difficult maneuver. "pinner" : a telemark (special type of skis) skier, named for the pins in the toe of the boot. "sitzmark" : A term that comes from a German word for the depression left in the snow by a skier falling backward. "knuckle-dragger" : term for a snowboarder, because they drag hands in the snow while turnng. "figure eleven" : the tracks left by a skier making no turns. "channel twelve" : a gaper trying to do a figure eleven but hunches down and sticks their poles in the air. "s's" : the tracks left by a single skier making very regular, very good turns down a powder slope. "eights" : the tracks left by two good skiers making "s's" in synchronization on the same fall line, but one behind the other and crossing their tracks. "tuna points" : a skier who loses control and wipes out into a net either in a lift line or more commonly during a race. The reference to "tuna" is from being "netted". I have some electronic gear along to help build this WWW site and to stay wired while on the road. Click here to find out about it. In addition, several people have asked about the technical details of this web site such as what kind of machine is ski-epic.com and where is it, etc. Click here to find out all about this. Macromental is an investment research firm that connects equity analysts with industry experts. James Fleishman (friend): he wrote a book called "Inside Story: The Wall Street Criminal Who Wasn't"
Chris Pirazzi (friend, co-worker): http://www.lurkertech.com/ who now lives in Thailand and wrote a cultural guidebook for westerners on Thailand called Thailand Fever and also a Palm Pilot based Thai to English and English to Thai Dictionary called Word-In-The-Hand. Chris also created MapFling where you can get a map, add your own labels, share it with others.